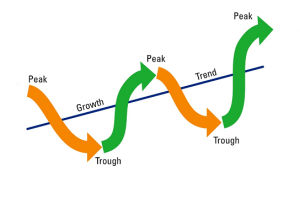 Cyclical Stocks: What are Cyclical Stocks and How to Profit with Them? We all know that value investing involves buying stocks at prices depressed below the intrinsic value. Cheaper the stock, better the purchase, as theoretically the potential returns (normalizing the price to value) are higher and the inherent risk of capital loss is lower (stock is already at distressed levels where investors have given up – see distressed investing). Most cycles in essential commodities are predictable. The business in an industry goes through a period of growth, managers become more confident and hire more employees, invest in assets and new projects and build new plants and increase capacity. There are new entrants in the industry as it grows with above average profits. The analysts build Discounted Cash Flow and other models that assume good earnings growth for the near future and a possible terminal growth rate thereafter (which is almost always a positive number). This results in higher multiples being assigned to the cyclical stocks in the industry than the historical average. Wall Street firms do a lot of business with these growing companies flush with profits and are therefore inclined to look upon them in a kind light. Investors pile in. All the capacity expansion via new capital investments and new entrants in the industry finally reaches a point where it starts to exceed the market demand. The profit margins get squeezed as the marginal unit of production starts to sell at cost or below cost. The high cost and smaller economies producers start to exit the market. A few players may merge to improve their economies of scale or add in new line of businesses to support the company until the cycle in this line of business recovers. Wall Street starts getting disappointed many quarters running as the earnings come in lower than expected. Supply now starts to exceed the demand. Product price falls. Weaker and high cost producers are unable to stay in business and exit. Larger and lower cost producers may choose to exacerbate the situation by making counter-intuitive moves such as increasing production – to drive the prices further down and hasten the exit of weaker competitors, as long as they are able to at least break even. Predatory pricing is generally illegal in most developed economies, but increasing production is not and can easily be blamed to an error in judgment. Analysts don’t understand what is going on, and if they do understand the competitive games being played, they do not talk about it. Investors start to lose interest and move on to the greener pastures. Businesses disappear, jobs are lost, capital projects are cancelled or postponed, assets are scrapped, and eventually the supply starts to decrease. Supply has finally dipped below the demand. The surviving businesses have started to gain their pricing power back and have begun to enjoy improved profit margins. They have also emerged from the cycle with a bigger market share as a large number of competitors closed shop. At this point, Wall Street has likely lost all interest in these companies and analysts have dropped coverage of their stock. In Phases 3 and 4 the stock is likely to be undervalued. The cheapest and safest time to invest is in Phase 4. However, timing the bottom of a cycle is difficult and almost impossible. The best a value investor can do then is decide to invest some time after the decline has started and has gone to some depths, and then choose the stocks of the companies that are more likely than others to survive and come out with an increased market share. Which Kind of Industries does Cyclical Investing Work In? In industries with low to zero cost of entry, such as software or internet, cycles do not exist, or if they do, they are short lived. Some barriers to entry for new competitors can be established by increasing the switching costs for the existing customers – it is difficult for the whole enterprises to switch over to Macintosh when all their business systems are written for Windows. However, these switching costs are not insurmountable. The story is very different in industries where a significant capital investment is required to enter an industry or a market. For example, airlines, mining, shipping, automotive production, most manufacturing, real estate development, etc. In these industries, capital projects may also have multi-year lead times before they start contributing to the business. Therefore a project started today (such as a new ship ordered to be built when the market was doing very well), could take years to complete. When it is complete though, the company may be adding new capacity in an environment of glut. Therefore the cycle of boom and bust may be quite drawn out in these industries. 1. Pick an industry that is not going to disappear any time soon or substituted out with something completely new. 3. Wait. Understand that these industries are going to go through structural changes and countless investor confidence ups and downs before the winners and losers are determined. Track if your pick continues to be a strong contender as a winner, but otherwise mostly wait. 1. Low P/E ratio stocks (pe ratio formula) – these are the companies whose earnings have been decimated. If anything, a great value stock here might actually sport a sky high P/E ratio. The trailing 12 month or 5 year values are no longer typical, and the future earnings estimates are worthless. 2. Low P/B ratio stocks (what is a good price to book ratio?) – since we are looking at asset heavy industries, it is worth pointing out that the valuation of the assets on the books typically get written down when the industry is in stress like this. Therefore, cyclical investing for a value investor is much more of an art than science. Things like the strength of the balance sheet, economies of scale, management experience and skill, customer relationships, their ability to raise funds, cash and debt levels in the business, etc. become much more important. We still need to consider the valuation, and the valuation comes from asking the question: what is this business worth to a sophisticated buyer (competitor, private equity, etc.)? Sophisticated buyers are the ones who are buying for long term strategic advantage. Now consider the plight of a retail investor who has no time to analyze these companies and more than likely there is no longer any Wall Street coverage on these stocks (or if there is, it is much reduced from its heydays). These cyclical stocks will be volatile and if you think you are getting a great value, it should not be a surprise that the stock is an even greater value few weeks or months down the line. For most cyclical investments like this, I generally ease into my full allocation by starting small and then adding more and more over time when the cost can be improved. Sometimes, the extent of the future declines may surprise, but the declines themselves are to be expected. It takes time to hit phase 4 and then turn around. Any search for great value stocks to buy will undoubtedly turn up a few cyclical stocks. It is important to identify these and the stage they are in to profit from them. Thank you Aseem! Really appreciate the kind words. All the best.